A defendant is a person or entity that is facing a civil lawsuit, or that has been accused of a crime. The word “defendant” is often used interchangeably with other terms including “accused” or “respondent.” A criminal defendant has been charged with committing a crime, and is often placed in jail until bail is posted or the resolution of a trial. A civil defendant has been accused of a civil wrong, such as causing property damage, or failing to fulfill a contract, and may be ordered to pay monetary damages to the plaintiff. To explore this concept, consider the following defendant definition. noun. A person or entity that has been accused of a crime, or from whom civil relief is sought in a civil lawsuit. There are two types of action in which a person or entity may finds himself a defendant: criminal and civil. While both of these consist of a person being accused of something, the court process and penalties vary. Criminal charges are typically much more serious than civil charges, as they may include imprisonment. A criminal defendant is a person who has been charged with committing a crime as defined by law. Criminal defendants are subject to criminal trials and the other party, also known as the “accuser,” is the prosecuting attorney. When a person commits a crime, he often faces a criminal trial. Some criminals are arrested for their crime, however that is not always the case. For minor infractions, such as speeding tickets, the defendant may be instructed to pay a fine or appear at court on a specific date. If the defendant fails to do either of these things, however, it can result in a warrant being issued for his arrest. There are certain crimes, such as theft, assault, and drugs charges that result in arrest after charges have been filed. In these cases, the prosecutor may take the facts of the case to a grand jury to seek an indictment. If successful, the defendant is charged and tried, possibly without ever having been arrested, his punishment awaiting the resolution of the case. A civil defendant is a person that has been accused by another party of a civil wrong. The person bringing the lawsuit against the defendant is known as the “plaintiff.” In civil cases, both the plaintiff and defendant appear in court, though arrests in civil suits are rare. In some cases, the defendant can avoid appearing at court proceedings if he has an attorney appear on his behalf. When a defendant loses a civil suit, the penalties are often much different from those that occur in a criminal court. Most commonly, if a civil lawsuit is lost, the defendant is ordered to pay monetary damages to the plaintiff, and may also be ordered to pay the plaintiff’s legal fees and costs. In some cases, a person can face both civil and criminal charges, becoming a defendant in both cases. For example, John has been accused of embezzling $100,000 from his employer. John may be charged with embezzlement as a crime, being subject to potential prison time and other penalties. Additionally, John’s employer may file a civil lawsuit against John in an attempt to recover not only the embezzled $100,000, but additional losses resulting from the criminal act. If a person becomes a defendant in a civil or criminal suit, he should consult with an attorney. While hiring an attorney can become costly, it can be beneficial as it helps ensures the defendant’s rights are protected. An attorney can also help a defendant understand the laws and the court proceedings that will take place. It is vital for the accused to seek an attorney experienced in the type of crime or civil wrong of which he has been accused. The procedures of both civil and criminal trials differ in each state, and can become complex. Hiring an attorney specifically experienced in criminal or civil law in that region helps ensure the defendant’s needs are met. Bail – property or money deposited or pledged to a court in exchange for release from jail. Bail is set on the understanding that the suspect will return for trial. If he fails to return, he loses the money or property and a warrant is issued for his arrest. Infraction — a violation of a law, agreement, or set of rules. Litigation Costs – costs or expenses associated with prosecuting or defending a civil or criminal matter. These may include legal fees, expert witnesses, copies, postage, and other expenses. Prosecuting Attorney – an attorney that prosecutes criminal cases on behalf of the government and its people. This is an attorney employed by the “District Attorney’s” office in many jurisdictions. 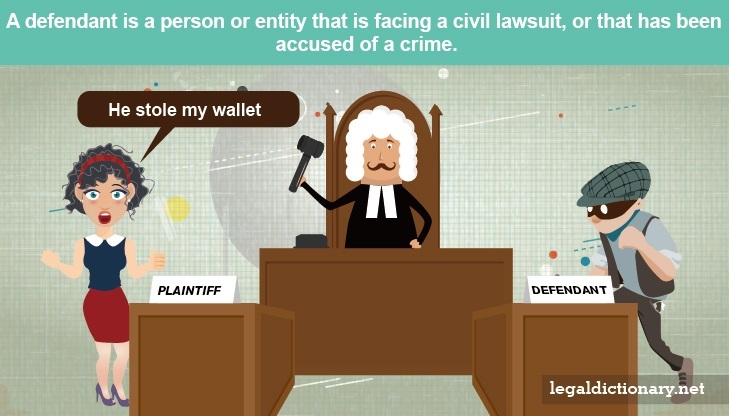 Plaintiff – a person that bring a case or files a lawsuit against another.